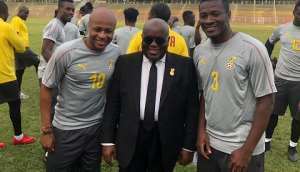 National Sports Authority Board Chairman, Kwadwo Baah Agyemang has revealed why Black Stars skipper, Asamoah Gyan and deputy skipper, Andre Ayew Dede Ayew met President Nana Akufo Addo. There were widespread reports that the pair met the first gentleman of the land to discuss how the country can win the 2019 Africa Cup of Nations in Egypt. And according to him, the meeting was to iron out the issues of winning bonuses and other related issues for the team ahead of the 2019 African Cup of Nations. “It’s true they (Asamoah Gyan & Andre Ayew, Black Stars captain & vice) met President (Nana Addo) to discuss winning bonuses and everything that would be needed to help Ghana win the AFCON," he told Kumasi based FOX FM.